Not only in the context of individual people’s specific circumstances, whether embedded in real history, or just a work of fiction, but, in the broadest sense. Somehow, our individual experiences which innately reject confinement, resist restriction, abhor oppression, these seem to connect us all to the larger, human story. A larger quest. A deeper need. And of course, the Flat Earth topic is fascinating in how it serves to bring particular facet of our human nature into such sharper focus. Is at least part of the reason why so many people have such a violent and repulsive reaction to the idea of an enclosed world? Does it perhaps have to do with even more than just all the propaganda and programming, all the humanistic pride invested in our perceived scientific understanding, and actually connect to soomething on a more sub-conscious, even spiritual level..? Is it possible that the fraudulent invention of a massive, virtually infinite, deep space cosmology, was ultimately easy enough to pass off, because deep-down, we hate the idea of there being walls of any kind? Hate even the suggestion of limitation? And how does the recognition of the Earth and cosmos itself being a much more confined, finite thing, relate to all the other forms of restriction, oppression, and control being perpertrated upon humanity by this ever-encroaching system being built all around us…? What do these “Elite”, really know..? What are they hiding? What are they seeking to accomplish? Is it more land? Far off somewhere across an icy, infintie plain? Is it the Firmament? Do they hope to finally break through to waters above? Do they intend to use secret technology to create some kind of inter-dimensional portal, effectively hopping the wall by defying the laws of time and space..? What are they doing? What is going on? And what does it mean for us? Are we trapped? Is there some realistic dream of ascension? Can we too transcend whatever limits exist in the cosmos, and ourselves one day soar into the heavens, whatever that actually means…? What IS on the other side…..??? But then in the midst of all these traditions, there was one which stood apart. In the conviction of this small, isolated line of people, the only being worth trusting was the Creator Himself. The Eternal one. The God who made everything, even the host of angelic creatures, in both the heavens, and below. Unlike the teachings of all the other so-called “gods”, this message did not claim that humans could one day climb the ladder of progress to the eventuality of a long-sought quantum leap in consciousness. There was no cyclical wheel of birth, death, and rebirth, no mountain of pious works to hope to accomplish, no secret rituals to learn and unlock the mysteries thereof..
You see, among all these centers of civilization and alleged progress, was a universal sense of longing, a striving, a recognition of the underlying need to break free. To escape… And these false, finite, fallen “gods” provided an endless array of ways by which men and woman sought to enlist the assistence of these beings, in the quest for enlightenment, for ascension. Mankind could never escape his own self, his own internal nature, and this is what sets the God of Abraham apart from all others. The God of the Bible, in contrast, tells us the unwelcome news that no matter what mystical secrets we might try to seek out, no matter what spiritual disciplines we might apply, no matter what towers we build, no matter what machines we might construct, there is simply, no way out. No way out, on our own, because ultimately that which imprisons us is not the lack of some secret knowledge, or third-eye activation, or our “ego”, or even the physical universe itself, but rather, our own rebellious souls. This is what I challenge EVERYONE to do, above all else. Before seeking to comprehend the amazing reality of the earth, or the heavens, to simply get honest with yourself. To ask yourself if perhaps indeed this prison of sin in your own life, as the Bible describes, might indeed be some of the most powerful evidence of all that what the Bible says is really true. Because the most beautiful news in the entire World, is that Jesus broke down the prison door. He laid down His own life, in order to become the Door, the Gate, the Portal, to Everything that humanity has hungered to get back to since the Beginning… He is the only way out. The only bridge between Heaven and Earth, between death and life, the only opening the impervious Firmament seperating us from the Creator Himself, through which we can freely walk through and enter into the Kingdom of the Father. Many people out there are under the impression that the Bible is simply another tool of control by the lying, murderous, “Elites”, but yet, if you dare to open up the Bible yourself, and read what it itself says, I am convinced that you will quickly begin to see how utterly false this claim really is. Those who seek to control humanity and break through the barriers apart from God, are only kidding themselves. In their futility they insist upon creating their own door, to eternity, to godhood. But you and I can make that same mistake. I pray that there are at least a small few of you out there, who hear this, and recongize that there is something resoundingly true about what I am saying, and if so, that you would seek the One who holds the Key. That you would seek Jesus. Ask Him. Cry out to Him. He will hear you. He always does. He’s right there waiting. Before I took a little “Christmas break” for myself, I made a couple of videos talking about the Mandela Effect, the second being Mandela Effect, Flat Earth, and the Nature of Reality. These videos received a fair amount of attention right away, and I got a lot of very interesting comments as well. I found the video below this morning, and most interesting is to note that it was uploaded in Aug of 2014, and so we can see that even at that point, over a year ago, people were talking about the Mandela Effect and the Berenstein Bears, etc…. The fact that false teacher Benny Hinn has made such bold “prophecies” about the death of Graham being the sign which will usher in some new era of ‘revival’ is also extremely peculiar, if you ask me. I’m sure he will no doubt be flooded with responses, but here is mine. So you know all about 9/11, Sandy Hook, the Boston Bombing, all the other false flags, the chemtrails, the rfid chips, the NWO, Bilderberg…. You know ALL the “stuff”. You know cuz you’ve researched all the “fringy stuff”, even when all the “sheeple” out there laugh and dismiss it as nonsense. But you won’t actually research the question of the Flat Earth. In fact, now YOU’RE the one laughing, and mocking, and deriding people for considering such a “ridiculous, crazy thing”. Most people have probably seen a news clip recently about Randy Quaid and his wife Evi being arrested over the weekend (as I did this morning). I suddenly found myself vaguely recalling seeing some random vid on YT some years ago, about how Quaid was in Canada somewhere, being filmed talking about the Illuminati in Hollywood or something to that effect. I always loved Randy Quaid, especially in National Lampoon’s Christmas Vacation as “cousin Eddie” (who didn’t though?) But somehow through the last five years of my “conspiratorial auto-didactation”, I somehow missed digging into this story being a passing glance. I was quite surprised to see the wife Evi has had a Youtube page, on which they’ve apparently been posting videos from what looks like public parks in Canada, up until the recent arrest in Vermont. Amazing. When you stop and consider that the Quaid’s legal troubles all stem from the seemingly victimless “crime” of allegedly “squatting on a property they used to own”, which was somehow turned into a vandalism charge, it’s hard to not see it all as looking incredibly fishy indeed. I mean, come on now… We live in the day and age where celebrities get away with just about every conceivable crazy thing imaginable, where drug binges and DUI woes get swept aside with just a sprinkling of Hollywood-lawyer pixie dust. In the case of the Quaids, apparently their former lawyer/financial manager was really the start of much of the trouble, in that they claim he was siphoning off funds, setting up unauthorized trusts, etc., and basically draining them dry. This is actually a pretty common thing in Hollywood, and the more I think about it, the more it makes me wonder if it might not actually represent a large part of how so many of Hollywood’s stars are effectively “handled”. I mean, if everyone knows that basically their entire fortunes, their mansions, their very careers and reputations, can all be ripped away and dragged through the mud at any time, then of course they’re going to “play ball”. Especially if it means ending up like like another “suicide”, a la Heath Ledger, David Carradine, Philip Seymour Hoffman, or Robin Williams. My goodness, if such a thing is really true, and someone of such “Hollywood royalty” stock wasn’t immune to being made an example of? How sobering to think of what degree of control the Enemy would truly have over the minds of everyone working in Hollywood and the media. That is real fear friends. 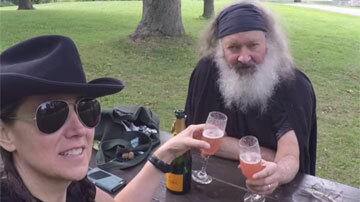 I know it’s easy to look at someone like Randy Quaid, especially now with his bushy beard and videos of him and his wife drinking wine in a public park, etc., and think that he must just be a washed up loser who broke the law and didn’t want to face up to his mistakes. I honestly doubt this narrative as much as I’ve ever doubted anything, and I think it quite possible that this “goofy actor” we’ve all loved might in fact be one of the few brave souls to have come out of the Hollywood machine in the past decades and actually spoken some diabolical Truth about the movie industry, even when he knew it would only make him appear crazier than any role he played on screen.